The laying of 150,000 flags should take around two hours. ST. LOUIS COUNTY — Thousands of Boy Scouts plan to honor members of the military for Memorial Day by placing each grave site at Jefferson Barracks National Cemetery with an American flag. Entering its 69th year, the Boy Scouts of America will gather at the site of Jefferson Barracks on Sunday for Memorial Day Good Turn to pay tribute to those who have lost their lives while serving the country. 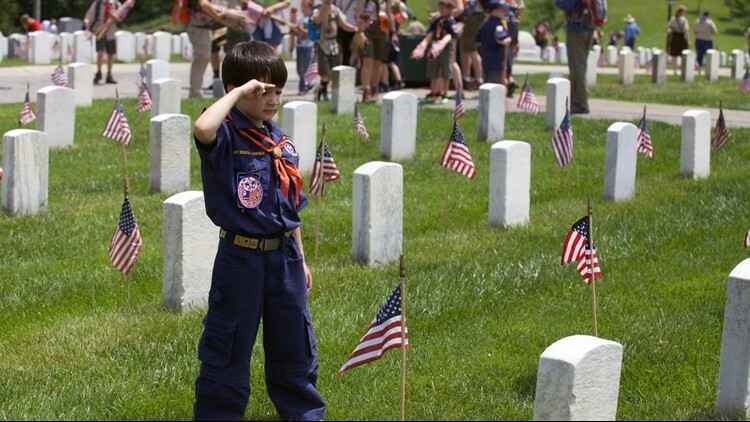 Approximately 4,000 Scouts from the St. Louis region plan to meet in conjunction to help place over 150,000 American flags throughout the cemetery. Prior to the flag laying, Scouts will raise the American flag before lowering it to half-mast as Scout buglers play "Taps." The laying of 150,000 flags should take around two hours, beginning at 12:30 p.m.